I hope you are enjoying (or soon will be) time with family and friends this Thanksgiving! 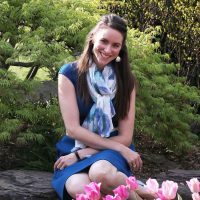 For my part, we are in California with my husband’s extended family—and 35 people will be sitting down to share dinner this evening! As you may imagine, I’ve been a little bit caught up in the frenzy of activity surrounding me. But yesterday I thought of you (in between baking 7 pies. Yes. SEVEN) and I made you some herb butter! 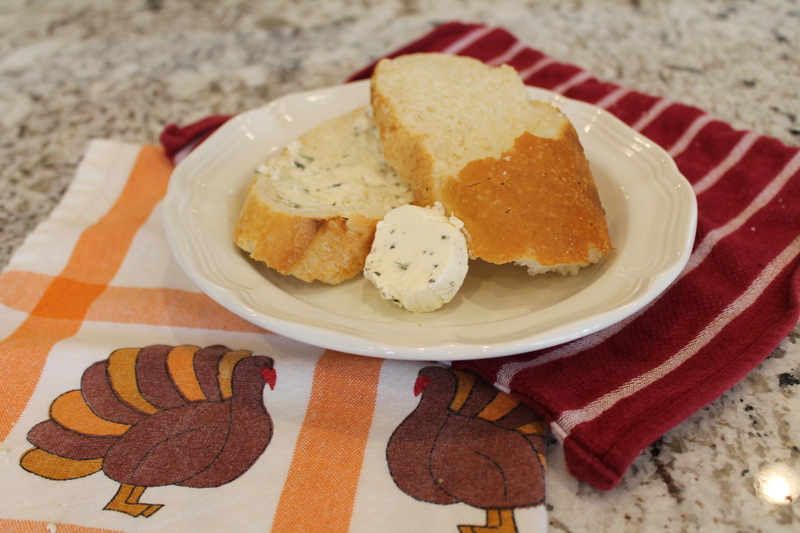 Fancy herb butter seems like the perfect way to add a little pizzazz to Thanksgiving (or Christmas, for that matter). It takes about 5 minutes to make, and it just adds a special touch to rolls and mashed potatoes. I especially recommend whipping up some herb butter if you are…erm, let’s call it “accepting grocery store help to get the meal on the table” (a.k.a., purchasing ready-to-serve bread, or making flaked mashed potatoes). I won’t judge you. Getting an enormous meal on the table is a huge feat, no matter how you accomplish it! 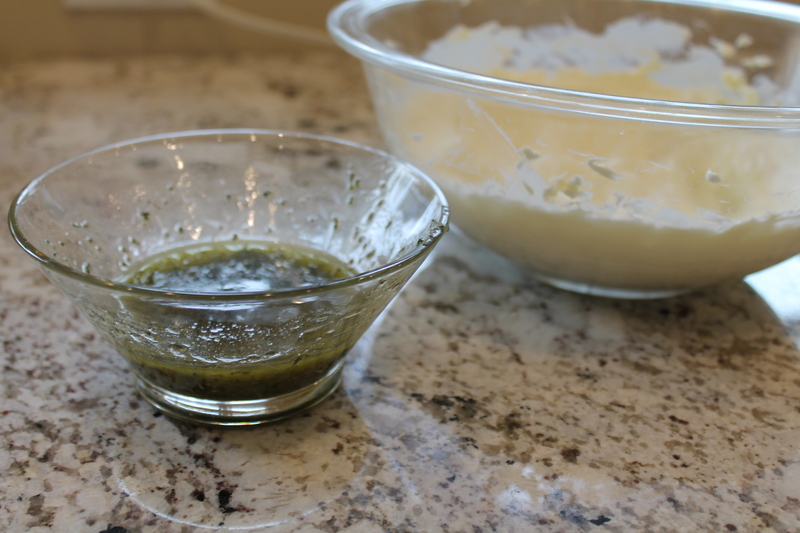 I’m just saying that herb butter will make everything on your table delightful, whether made from scratch or not. And the best part about herb butter is that you can pull it off at the last minute! This version uses herbs that are commonly packaged together as “poultry herbs,” so you probably already have them in your house! The key to making herb butter is starting with soft, room temperature butter. Don’t worry; if you didn’t set your butter out last night, you can always zap it in the microwave! Just be cautious: you don’t want to melt it! Turn the butter over every 5 seconds or so and heat in increments until it’s soft enough for your thumb to dent it if you press gently. 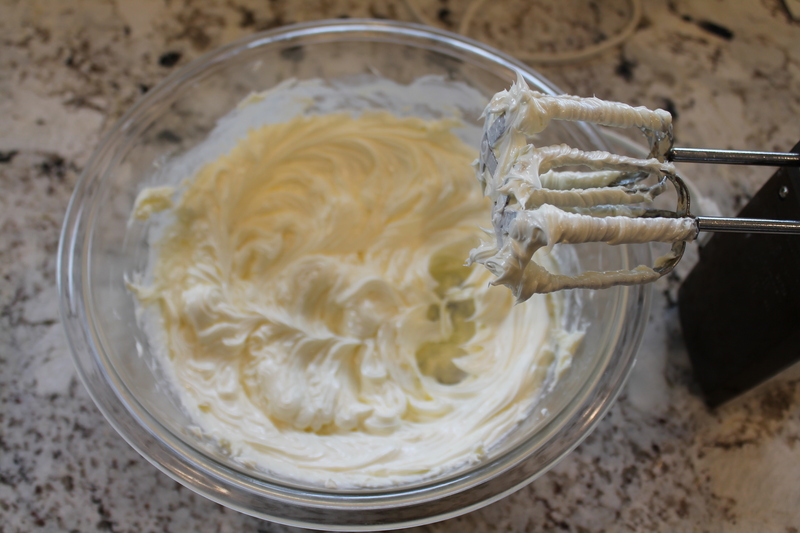 Whip the butter with an electric mixer until it is light and fluffy. I used unsalted butter and added 1 tsp. fine grain sea salt to it. You may also use regular, salted butter (because we are looking for convenience, here! ), but omit the extra salt. Now, chop up your herbs. I love the combination of sage, rosemary, and thyme. It smells a little light Christmas to me! (And, not surprisingly, puts a tune into my head…) Plus, it will work well with the rest of the meal, which likely contains a hefty dose of sage and thyme. 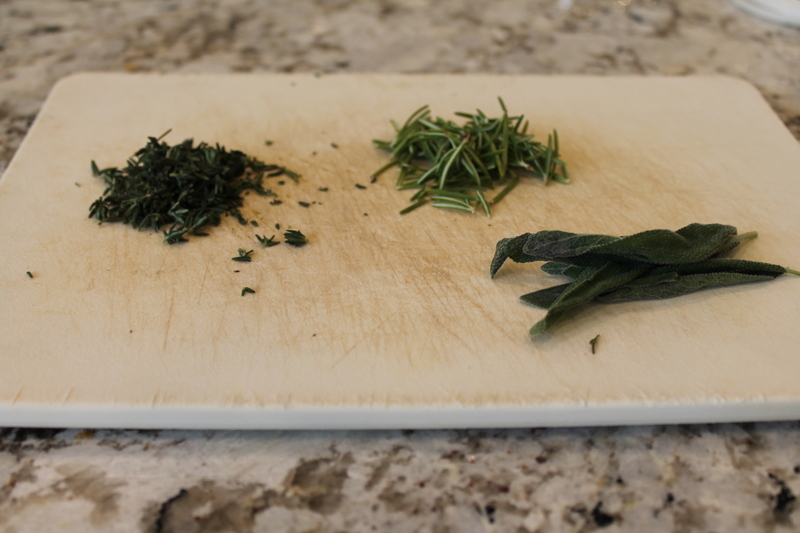 Ideally, you would roughly chop the herbs, then process them in a food processor. Drizzle in a few tablespoons of olive oil and continue pulsing. This will impart an herby flavor to the oil, so that it infuses the butter when you mix it in. But since I am staying at someone else’s home right now, I just chopped the herbs by hand and soaked them in the oil for a few minutes. I also squeezed half a lemon into the oil, which is totally optional. I would have liked to use lemon zest instead of juice, but I couldn’t track down a grater. Other things you might mix in include minced garlic and spices like cayenne. Plus, you really could alter the herb profile to suit you! Whip the herby oil into the butter. 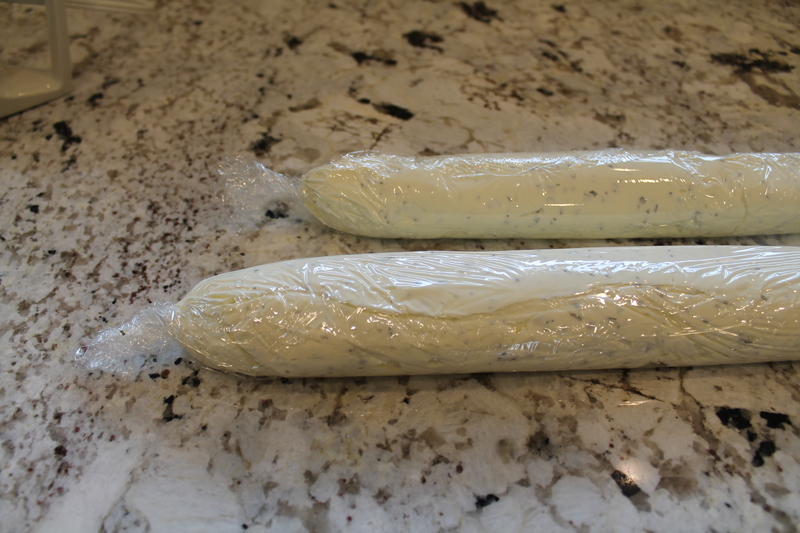 I spread the butter in a long stripe on a sheet of plastic wrap, then rolled it up and froze it. This makes for easier and prettier serving later! The butter will harden very quickly in the freezer, but will soften quickly when you are ready to serve because of the oil. You can use this butter on anything: veggies, bread, potatoes, even your turkey. Yum. Chop the butter into uniform chunks and place in a large bowl with the salt. 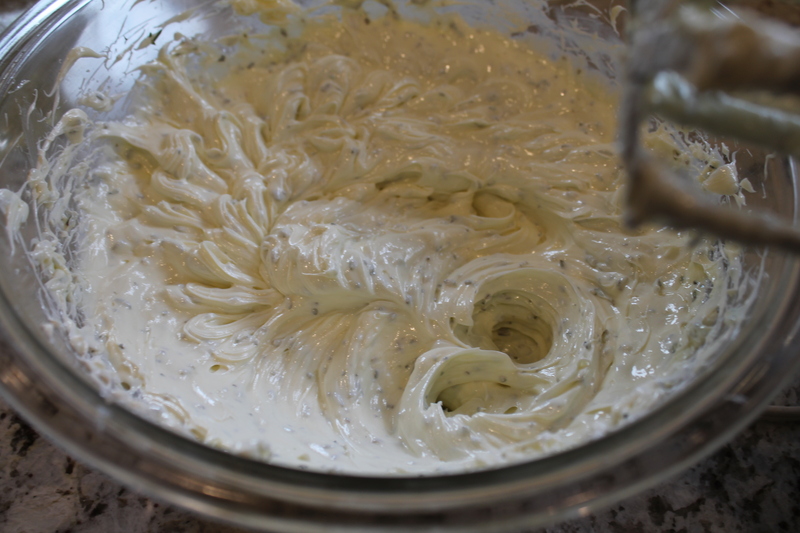 Whip with an electric mixer at medium speed until soft and light in color, about 5 minutes. Place the oil and lemon juice, if using, into the food processor and add the herbs. Blend until the herbs are fine and uniform and have colored the oil. Add the herb oil to the butter and beat for another 2 minutes, until oil is fully incorporated. Spoon onto parchment paper or plastic wrap. Roll into a tight log, twisting the ends of the wrap together to seal. Chill for 2 hours before serving.